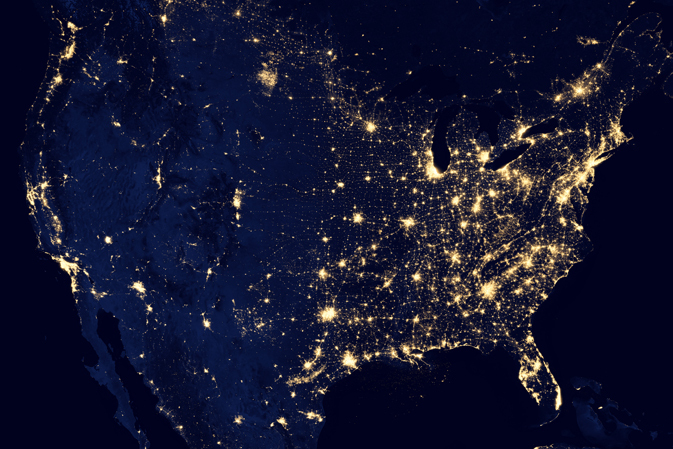 The United States at night. The U.S. electricity grid finds itself today at a critical juncture: old and falling apart, while at the same time more important than ever. The Inside Energy team has been digging into the problems—and potential solutions— in a series called Blackout: Reinventing the Grid. It began airing this month on partner radio stations and various other national and regional outlets. For a preview of what we’ve done and what’s to come, check out this trailer for our series, and stay tuned! Animated trailer produced by MacGregor Campbell, a Portland-based science and technology journalist. Alisa Barba is Inside Energy's Executive Editor. She worked for NPR as a regional bureau chief for 12 years and also edited Fronteras, a public radio collaboration along the southwest border. The aging United States electricity grid is facing an increasing number of threats, ranging from severe weather events to solar flares to cyber terrorism. It’s something the U.S. military is taking seriously, helping lead the way in the development of smaller and more secure grids – known as microgrids.